This exhibition “about the language of clothes and power”, and recently reviewed in the Guardian, seemed to be right up my street. My friend Nicola Dibb, who runs Women In Social Housing, brought it to my attention. 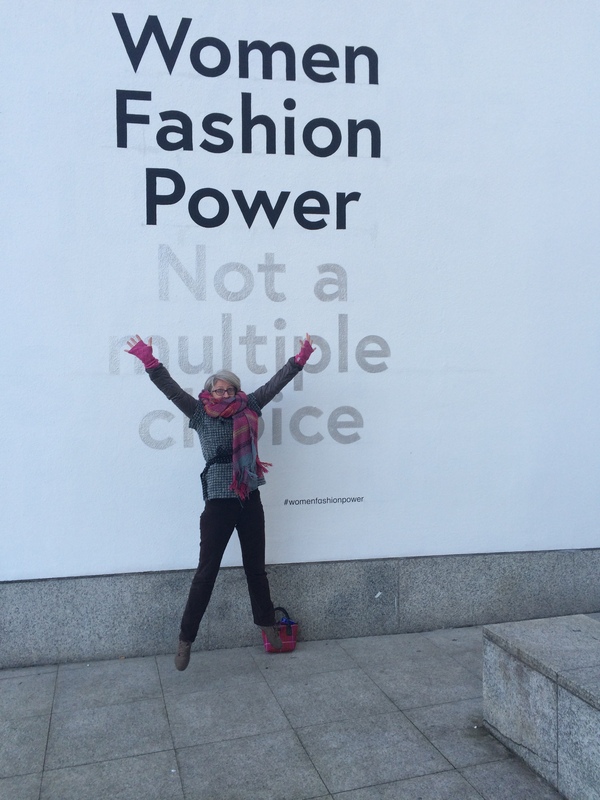 This weekend we went to see it, and although it is a terrific exhibition, I don’t think it delivered on the Women, Fashion, Power question. 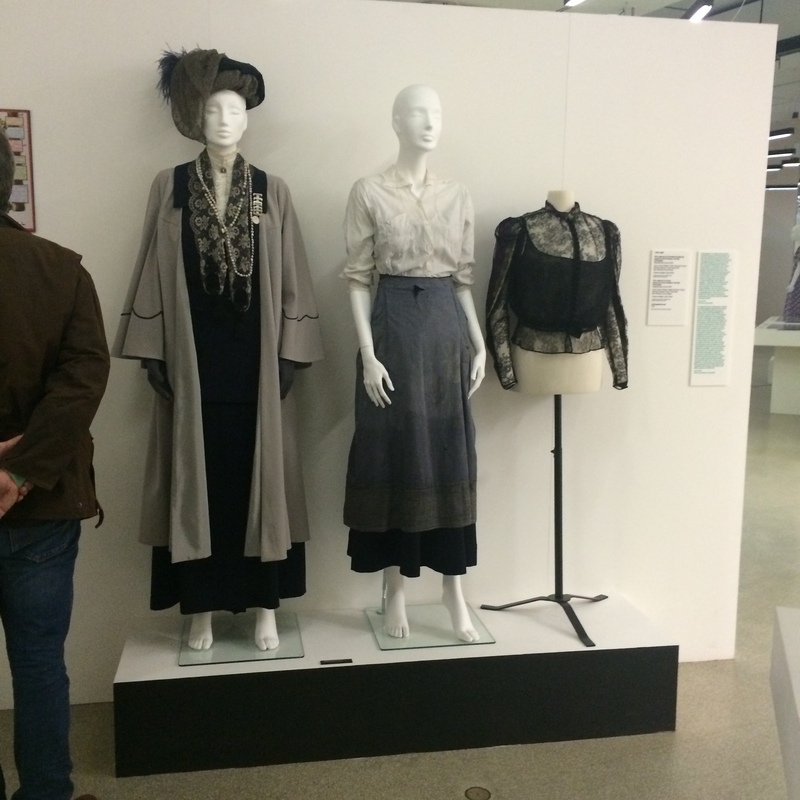 The meat of the exhibition is a condensed history of 20th century fashion, arranged by the decade. This is illustrated with contemporary photographs, magazines, newsreel and clothes gathered from a variety of sources, not least of which is Marks & Spencer from their own excellent archive in Leeds. The final section is really odd, and not very revealing. Here again we have a range of random “powerful” women from Camilla Batmanghelidjh, to the wife of the Deputy Prime Minister (who provides a Zara dress with a plastic belt), to Joan Burstein of Browns, to a woman who works for Argent at Kings Cross, the CEO of Nails Inc, to the Queen of Monaco, and the ubiquitous Shami Chakrabarti of Liberty. Clearly they had made an effort to get a good showing of non-White British women, and some Chinese women too, but the fashion industry was over represented. I am not sure I would have picked out any of these women as “powerful”. Each one is recorded saying why she dresses like she does, but it all seemed rather trite to me, accompanied as it is by fuzzy film of the clothes, which are on show, in any case. So I don’t think this exhibition gives us much in the way of insight into women, power and fashion. It is a strange mish mash between avant guard high fashion (Vivienne Westwood outfits and tartan Dr Marten’s), a few high street items (Etam mini skirts), a Princess Diana evening gown and a suit from Mrs Thatcher. 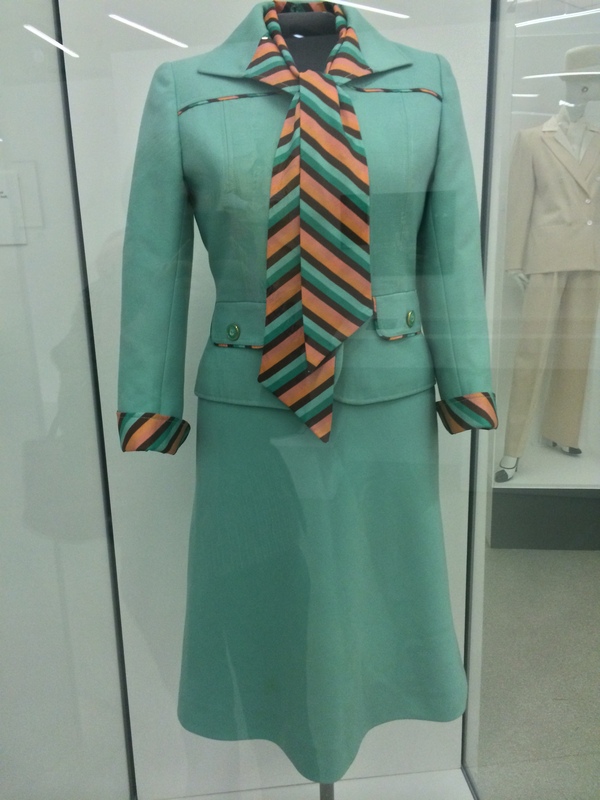 This jade green wool suit by Mansfield was worn on the day she was confirmed as Conservative Party leader in February 1975. There are some really nice things to look at. You can get up close and have a really good look, and you are allowed to take photographs, which is wonderful. I would urge you, if you can, to go and see this exhibition at the Design Museum before it concludes in April. But if you want to learn about women, power and clothes you will not learn much from this exhibition, sadly. Let’s start with a list of female CEOs, senior politicians (not their wives, please), the entrepreneurs, the inventors, the ground breakers. Then let’s have a good look at what they wear and why. Thanks Kate. Now that I’m in Riga, I’m going to be a lot more appreciative of posts like this (London exhibitions). I like Mrs Thacher’s suit – the combination of masculine and feminine features, authority and style. Hope the move went well, Galina! Great look in the top photo, K.! I read about this exhibition a while ago and wondered about it. It does seem that they chose an incomplete list of women. The women I’ve known who were leaders (journalism, business, diplomacy/government, research) had very interesting and in many cases conflicted relationships to fashion. I guess it was difficult for the museum to get such women to agree to participate in the show in large numbers? Something that I have found to be true, at least in academia, is that the most accomplished female researchers have uninteresting wardrobes (dominated by the black pant suit, with perhaps a colourful scarf at most). One extremely bright and accomplished professor I knew consistently wore a National Bureau of Economic Research sweat shirt several days a week. It’s that fundamental conflict between being perceived as “serious” and admitting that you like clothes. In the case of academics and researchers in particular, that’s something that’s cemented in the mind from a young age, as many of these women have never left school. This may be changing with a younger generation…I don’t know. Good analysis, especially of academia. These women are saying they have more important things to do, but are biting themselves in the foot as the drab wardrobe keeps them, and consequently their work, hidden. How you look really is Important. Yes, K, perfect shot for this review. Thanx for an honest view. Thanks! In general I think that’s right, although in the case of the sweatshirt professor above in fact she is now the chief economist of a very important institution. Likewise with another woman I know who always wore a black pant suit. She won a prestigious medal and is widely read and consulted. I think it would be fascinating to pick the brains of such women and others from a wide array of fields as to their responses to fashion. I’m especially fascinated by women in politics. Probably the only fashionable woman we’ve had in federal politics here was a very particular case who was in the end treated badly by the press. It sounds interesting but perhaps too broad. I agree, highlight the women who are really at the helm! Wish I could jettison over and see the show!